The Default view of the gallery is Albums, a list of all folders with photos in a rectangular grid. The other views are Locations (photos are grouped based on where they were taken), Times (grouped by when they were taken), People (photos with tagged faces in them) and Tags (these are general tags you can add manually). A handy option is the Make Available Offline feature - it lets you easily select multiple online albums and download them for offline viewing. The Gallery app supports online albums like Picasa (but not Facebook) and you can set it to sync photos over Wi-Fi only. Viewing single images has been tweaked somewhat. You still get the convenient share button along with a menu with several options - Crop and rotate tools, a more feature-rich Editor (we'll get back to it in a minute) and a slideshow. You can swipe left and right to move between images in an album and you can also pinch to zoom out to display a strip of three images at a time. This is an easy way to quickly browse photos but also delete some - you just swipe them up or down. When you discard an image, an undo button appears allowing you to restore it. A small icon at the bottom left launches the Editor (or you can do it from the menu). The editor offers filters, frames, crop/rotate/straighten tools along with color correction effects ranging from auto color to manual curves control. Most of these options have a slider that lets you apply the effect with the desired intensity. Videos by default are once again accessed via the Gallery app. There is not a dedicated video player app. There's absolutely no way to sugarcoat this - the stock video player in Android has remained well below average in the latest 4.3 version of the OS. It played only MP4 format files, which were captured by the tablet's camera. Curiously, when we uploaded an MP4 movie via the USB cable, the player refused to play it. Of course, with the Google Play Store readily available, there are plenty of capable movie players to choose from. We managed the play the abovementioned MP4 file without any hickups, using a third party player from the Play Store. Google would also happily take your money for giving you access to its own rich library of available video content. Google Play Music is the default player for your tunes - both online and on your device. The dropdown menu is used to organize your music library - there's Recent (the default view), Albums, Artists, Songs, Playlists and Genres. While the player is working, a playback control widget that features the album art and track info for the current song along with simple playback controls is added to the list of widgets on the lockscreen, pushing back the ones already there. There are playback controls in the notification area too. 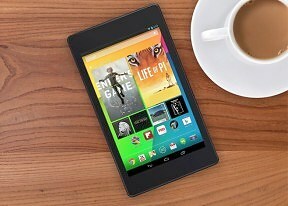 The Google Nexus 7 (2013) delivers perfectly clean audio output when connected to an active external amplifier. Its volume levels are lower than we would have expected from a tablet, but it's not too bad either. 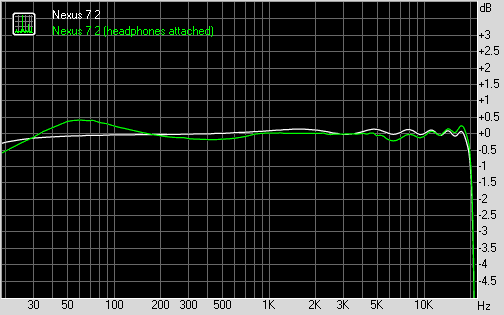 With headphones plugged in, the output quality takes a slight knock - the stereo crosstalk goes up notably and some intermodulation distortion creeps in. Volume levels drop significantly, too, so overall the performance is somewhat unspectacular for the tablet league. It's not too bad, mind you, and had it been a smartphone we would have been perfectly happy with it - it's just that most tablets tend to do even better here.